Starting from our bike sport center, at the coast of light, we offer you a wide program of beautiful cycle tours into the natural parks of Cádiz. Ride through the natural park of "La Breña" with beautiful views of the historical cape of Trafalgar. Rest at the beach of Los Canos de Meca. In this wide natural park of oak trees you can choice between different tours, also interesting downhills. All the tours start with a transfer to the initial point (~1h). 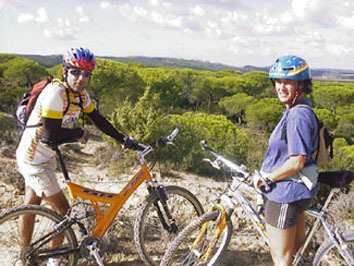 Cycle tour along the coast and the cliff tops of Conil, visiting the port and riding through the pine forest of Roche. Marvalous tour around the Natural Park of the Cadiz bay with its marshes and diferent water birds. After that we will take the boat to Cadiz (20 min) and have a break in the old city. On our way back with the bikes, we take a short trip with the train (15 min) to our initial point. All tours are guided by experienced, local guides!